In our recent post ‘New Year, New Project’ we spoke about making life changes in 2018. One of these changes might be to achieve a better work/life balance. Working from home can be a dream come true, so why not let Summerwood make it a reality? Cutting out the daily commute can free up 10+ hours a week, so it’s not surprising that many people consider working from home as a blessing. In fact, working from home is a trend that is here to stay according to labour market research. The New York Times reported last year that 43% of employed Americans spent time working remotely, while CNN reports a 115% increase in telecommuting workers in the decade between 2005 and 2015. Ambitions to work from home could be one or two days a week, or full time if you have the flexibility or have started your own business from home. Regardless, a home office can be the perfect solution to achieving that greater work/life balance you desire. But how do you do it right? A shared space where you’re contained within the same four walls, days or weeks on end, can cause cabin fever, where maybe your dining table doubles as your office desk or your couch is the most comfortable office chair. It can mean having to clear away your laptop and work documents so dinner can be served, or family trailing in and out to chat while you’re on the phone. Maybe you can’t fully relax, because rather than the age-old problem of taking work home with you, work literally surrounds you 24/7. Are we painting an idyllic picture? Probably not, because we know you need a dedicated working space, away from the distractions and interruptions, but also a place where you can close the door and say that it’s the end of the work day. A separate backyard prefabricated build may be the answer. Here at Summerwood, we’ve noticed a growing demand for backyard offices and studios, and worked with hundreds of customers to help make their dream a viable reality. We support you in your goals to work from home – to be productive, be comfortable, and be happy while you work. Working meters from your home has all the advantages you imagined; no more early rises to beat the morning traffic, no more humdrum commutes, and no more comprises to convert your work station back into a dining room. Instead, you have your own devoted office, a place in which you know you are there to work, away from the main house, and personalized to your liking. You can add features to keep the space organized, like module shelves, or livable spaces to gather your thoughts and be creative, like a lounge chair or reading nook. Many of our customers also add a stylish dormer window to create a little more natural light. And best of all, your family gives you space so you can work effectively and efficiently without being disturbed. Spend time browsing through our home office studio styles and our photo galleries of customer favorites. We have a number of designs that other Summerwood customers have designed, or you can use our Custom Design Center to make the perfect office space for you. Don’t forget: all of our builds, including home studios, include easy-to-follow instructions, diagrams, and assembly videos to help you through the process and we’re always here to answer any of your questions. Movember has come to a close, and even though the month might be past us, it’s a great reminder to celebrate the positive impacts that the month has every year on men’s health. In keeping with this, we have taken a closer look at the importance of a man cave and the benefits these masculine spaces offer. Elvis had Graceland, Tony Soprano had his Bada Bing room, and Al Bundy had his garage – men carving out their own places is nothing new in popular culture. Even before TV, men have found peace in a number of male-oriented spots, whether in a pub, workshop or den. Places away from the stresses and demands of everyday life aren’t a distant dream; they’re just going by a new name– the man cave. The benefits that come with a dedicated, males-only space make a great case for why a ‘mantuary’ is the perfect Christmas present to yourself or the special man in your life—here’s why. Stress relief is the basic reason that every man needs a man cave. There’s no arguing that sometimes you need to escape the everyday grind of life, but vacations aren’t always an option. After the demands and challenges of a long day or workweek, we all seek a place to unwind, where we can surround ourselves with creature comforts to relax. Can you think of a better way to do this than in a space of your own making? This point really does pay homage to the ‘cave’ in man cave. The act of gathering around a fire dates to prehistoric times. At the end of a long day’s hunt, man would sit and rest in front of the fire, watching the flames. He needed time to recharge his energy for the next day’s hunt. Today, the natural instinct of a man after a long period of work or intense activity, is still to ‘fire-gaze’, or to ‘zone-out’ in another way, like simply watching Netflix or reading a newspaper. Both physical space and headspace are needed for us to decompress and prepare ourselves to jump back into the grind. A man cave offers a space free of demands, where a man has the freedom to completely turn off from the world and prepare for the next hunt, sales meeting, or family dinner. Female-led decorating and interior design is common in many homes, sometimes leaving male-tastes unfilled. This can be disheartening to men, as their favourite sports paraphernalia, video games, or large-screen television from bachelor days are relegated to the attic or not-so-accidently sold at last week’s garage sale. A man cave is the perfect spot for a man to carve out his own domain, allowing for more masculine items, that may not be suited to the main house, items like a pool table, exercise equipment, game station, reclining chairs, or a bar. Men can style their man cave’s interior to fit the vibe they want, whether this is minimalist and spartan, a traditional pub scene, or an inspired workshop for dreaming, planning and building. Decorating the man cave to reflect personal taste and individuality can be satisfying. While each man cave can be as different as the men who inhabit them, there are no right or wrong ways to decorate. If the space is filled with things that make him happy, how could it be wrong? As we go through life, and face more demands on our time, we can lose touch with earlier life passions – where hobbies fall by the wayside or we forget to explore new interests. Whatever your interests might be, having a space to maintain a lifelong passion or discover a new pursuit and spending time on our hobbies helps our mental health and mood balance. From constructing model planes and miniature railway sets, to fixing motorbikes or household items, many men find working on logical or practical projects is both mentally stimulating and therapeutic. As well as having this mental health benefit for men, a dedicated outdoor building as a hobby or workspace carries the added benefit of keeping the home and garage clutter free! Less tense, more inspired— this is how most men feel after an hour spent in their man cave. A man who feels recharged is able to be his very best self, allowing him to bring more to his everyday, including his relationships, especially with friends and family. Personal spaces are important in maintaining overall happiness and a sense of self—and have proved themselves as helpful outlets for those with significant others. What’s more, in some cases they’ve inspired partners to seek out a space of their own, like She Sheds. The benefits of a man cave are numerous, and far-reaching, but the process of setting up your own is easy. The assembly process for Summerwood buildings is safe, simple and fun, as our pre-cut and pre-assembled kits allow you to do-it-yourself, or to hire a contractor for extra help, while our Custom Design Center lets you personalize a building to fit your home, landscape, and lifestyle. We cover the whole spectrum of design choices, and ship our products throughout North America and beyond. 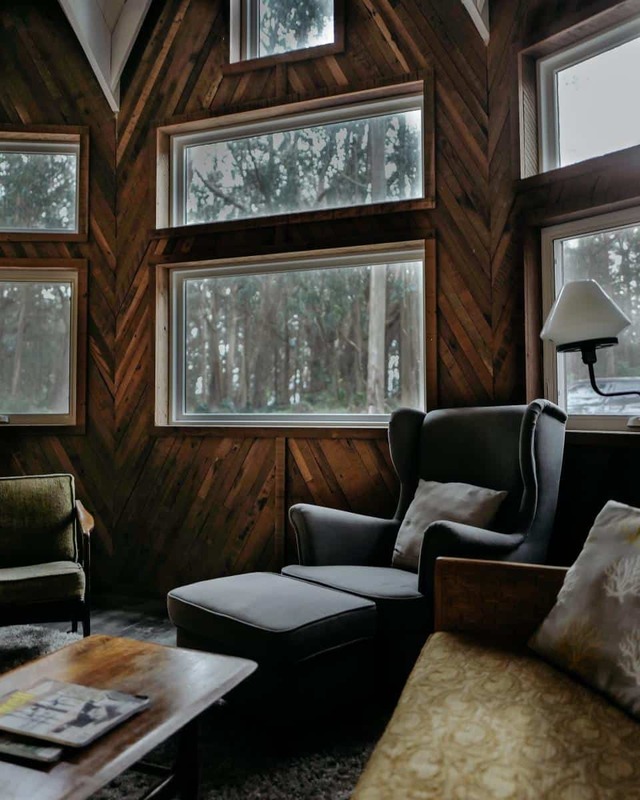 For inspiration, browse our cabins and studios or search here among over 1,000 finished project photos submitted by delighted Summerwood customers. Whether you need a little or a lot of help, contacting our experienced design specialist team here can help you get the ball rolling on the man cave of your dreams, and build the foundation for a great year ahead. After constructing your new outdoor building, you may find yourself searching for reasons to spend time there. As you organize the space and plan fun activities to enjoy during your visit, make sure you know your limits – and the limits of your structure. Although the vast number of pastime options may feel limitless at first blush, there are a few activities you should never try in your outdoor building, so long as you wish to avoid suffering the swift repercussions. To remain safe and sound, and consequence free, remember to avoid the temptation to try the five following activities in your outdoor structure. Although roasting marshmallows in the comfy confines of your outdoor structure sounds incredibly decadent, it is also quite a dangerous proposition. Unless you have a fireplace, leave the flames and smoke outdoors where they belong by creating a fire pit and seating area a safe distance away from your buildings. If you absolutely must gaze upon the crackling logs while relaxing in your outdoor building, install a TV screen and tune into one of the many simulated fires to get your fix. An outdoor building can give you the peace and quiet you need to churn out beautifully painted masterpieces one after another. If, in your frenzy to get painting, you forget to pop open your doors and windows, the fumes could build up and knock you through a loop. Avoid the fumes, and their dizzying effects, by either painting elsewhere or installing centrifugal fans to actively circulate the air as you create your works of art. Opening the windows and doors probably couldn’t hurt either. Feeding the wildlife from the doorway of your outdoor building will only serve to draw them to that structure in great numbers. Since life is, sadly, not a Disney movie, the wildlife will likely end up causing more harm than good. To keep their potential for destruction to a minimum, avoid setting out snacks or treats for birds, squirrels or any other wildlife anywhere near your inviting outdoor building structures. Although an outdoor building makes an excellent sprout station and garden depot, you must actively identify your plants to keep your garden, and you, safe and sound. After all, you just never know when the mystery shrub from the corner shop will grow far too large and demand the finest of foods in song. Keep your garden tame by growing your favorite fruit, vegetables and flowers under a combination of natural and artificial light. Outdoor buildings seem fit for a bash, but planning a pool party might be taking that sentiment a bit too far. The splashing and laughing – and fun filled chaos – will do little for the health and wellbeing of your newfound favorite outdoor structure. A spa session, on the other hand, might be just what the doctor ordered. With a little thought about your favorite activities, you can easily transform your outdoor buildings into true extensions of your living space. You can use your imagination to turn each space into an office, computer lab or even an art studio. As your interests change, do not shy away from updating the space yet again to support your latest endeavors. With extra outbuildings at your fingertips, you will always have the space you need for your hobbies and projects. Imagine being a kid and trying to convey to your parents exactly what you want from a playhouse. Everything’s adult-sized and you’re rarely allowed your own space. That’s why kids love Summerwood playhouses so much. We encourage including your kids in the design of their playhouses. The little touches they add make them proud to call it their play-home. Besides, getting the kids involved means extra help during the building process, right!? Playhouses are an easy backyard addition. Due to their size and purpose, you probably won’t need a building permit. But, there are a few important things to consider before purchasing your playhouse: does your backyard have the available space for a playhouse? How can you ensure safely for the little ones? Is a playhouse the best option for your family, or would a small shed prove to be more useful? Summerwood offers three standard playhouse models to choose from, The Bear Claw, The Peach Pickers Porch, and The Petite Pentagon. These can be left as is, or customized to your, and your child’s content. When considering where in your backyard it would be best to place your playhouse, consider whether a rectangular, or 5-sided shape would best suit your space (read more about our space-saving 5-sided buildings for grown ups: “The Catalina: Our 5 Sided Corner Building”). The mini-porch space is the highlight of our Peach Pickers Porch model. 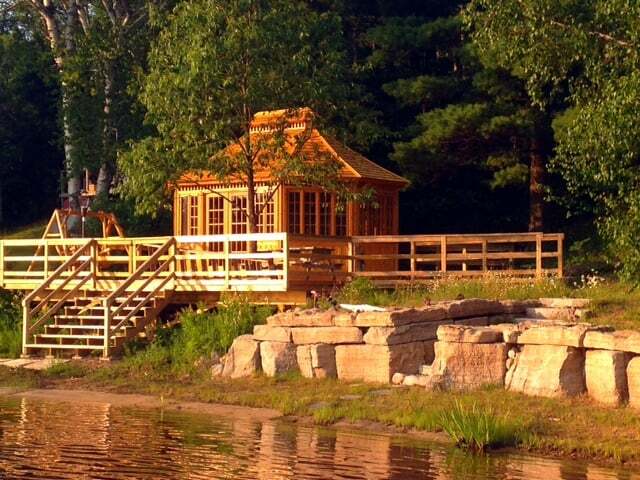 Like all Summerwood structures, our playhouses are built according to the highest standards and building code regulations. Playhouses can also include Plexiglas windows, or no glass at all to ensure that the children are free to cast spells and slay magical dragons without concern. Keep in mind as well that you may want to be able to supervise from afar while the children are at play, so when considering where to build your playhouse, ensure that you have a good vantage point. Although the children may love and appreciate everything miniature, it may not be the right option for your family in the long term. Summerwood structures are built to last, so it’s important to consider whether or not a playhouse fits your present and future lifestyle. If your storage needs are met, and you believe a playhouse will be thoroughly enjoyed for years to come, it could be the perfect backyard addition. However, a small shed may also be able to serve as a playhouse for the time being, and later function as a storage solution. A playhouse is constructed with the children in mind, so although it may be the perfect size at the present time, your family may outgrow it in due time. The design experts at Summerwood are happy to help you make a selection that will serve your family for years to come. A Five-Sided Corner Catalina, adapted to function as a playhouse until they’re all grown up. Kids are more likely to take care of their playhouse if they’re involved in the process. If you’re just starting to consider the addition of a custom backyard playhouse, don’t forget to take the opportunity to treat the kids like your personal design consultants. Have them join you at our Custom Design Center. It’s an intuitive “drag n’ drop” tool that they’ll love fiddling with. The modern housing market demands the inclusion of unique landscape designs and versatile outdoor buildings. Without these features, you will likely see your property value remain stagnant even as other homes in your neighborhood increase in price. Luckily, upgrading your outdoor buildings can provide a great return on investment when you go to sell your property and increase the overall utility of your home in the meantime. You may love the functionality of the outbuildings so much that you decide to stay rather than sell. In any case, you can facilitate consistent home value increases simply by smartly placing functional and attractive outdoor buildings within the confines of your property. When you add tastefully placed outbuildings to your property, you improve the aesthetic value and overall utility of your home. A simple detached garage structure, for example, can net you a return of up to 80% of your investment. A purpose built structure, such as a studio shed, however, has the power to push that return past 100%. Furthermore, the return is not the only reason to invest in outbuildings for your home. The addition of detached buildings on the property helps drum up interest faster when you do decide to place your home on the market. Quickly attracting the interest of buyers, and obtaining bids in droves, can reduce your overhead costs throughout the sales process. As a result, more of your funds will remain in your hands just by making this simple investment. Determining the best outbuildings for your home requires a bit of guesswork on your part. You should reflect on the lifestyle and interests of the surrounding community, and take a close look at the layout of your home, to determine the best outbuilding for your project. If you have a pool, for example, consider adding a pool house or Bunkie to the backyard to improve upon that feature considerably. If you live near a lake known for good fishing, consider a detached garage and shed that are both big enough to hold gear for an entire family. If you decide to add another outdoor building or two to your property but don’t want to start from scratch, many companies sell pre-fabricated buildings that require minimal installation. As Monday morning and a new week approaches, you may find yourself wondering where the weekend went. Maybe you’re not looking forward to a long commute, a stack of papers awaiting you on your desk, or responding to all of those emails. So, how do you make the work week a little bit better? For those that freelance, or are entrepreneurs, it may be most cost-effective to work from home. But working and living in the same space can cause stress, anxiety and make some feel a little stir-crazy. It’s important to separate work and play, and let your mind relax after a long work day. No one wants to see that stack of papers on their kitchen table! We’re all more productive if we make room for a break, out of sight and out of mind after a long day. But if you’re living in a small space, it can be difficult to achieve this. So what’s the solution? Well, how about moving that space outdoors? For those with a large enough backyard, a simple home office can completely revitalize the way that you work from home. A home office is a necessity for many, especially with many businesses operating right from their homes. However, for many families the office often becomes a catch-all space where papers and documents are dumped, computers are taken over by kids, and decor is an unfortunately, just an afterthought. So that got us thinking, what if we create an office away from the office, and the home? Moving your office outside can provide you with privacy and a quiet place to work. 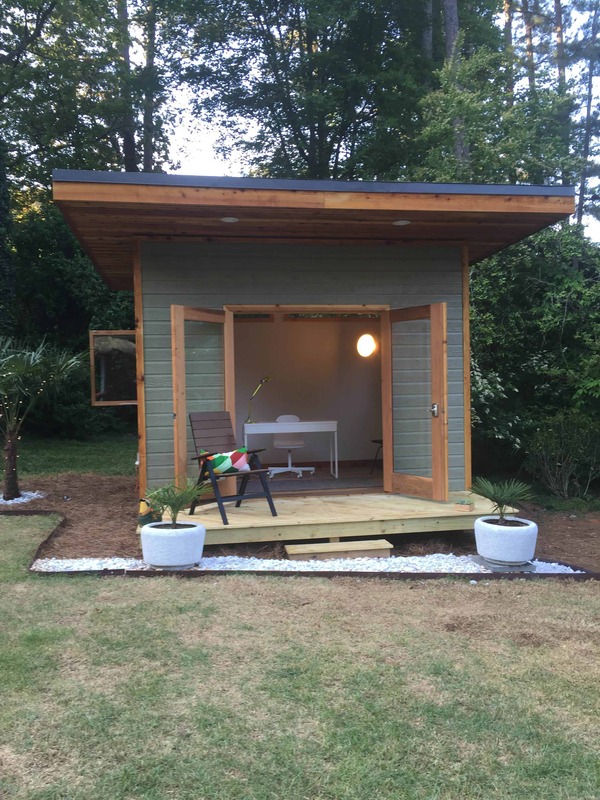 We’ll help you create a custom office and separate space in which you can create and explore, while enjoying the nature and solitude of your yard. Whether you work from home, or merely bring your work home with you (as many of us do), having a space that is conducive to getting things done without distraction is essential for many. If you’re tired of interruptions and papers piling up in your office (or anywhere else in the home), a custom office might be just what you’re looking for. Summerwood Products can help you create an office space and private work sanctuary for you, your family or your business, all for less than a home add-on or reno. Not sure where to get started? Below we’ve got a few points to consider before you begin designing your personal custom home office. When searching for the perfect backyard home office for you, you must first decide how large a space will fit your needs. You want to ensure that you have enough space to work comfortably, without feeling cramped, but also ensure that the constructed office does not overwhelm the entire backyard. That’s why starting with a plan is ideal. You have the freedom to choose an exact size and truly customize your home office to fit the outdoor space you’re placing it in. Just brainstroming? Visit our Design Center to start generating ideas for your new office studio. It is also important that you research the bylaws of your municipality to ensure that it is legal to begin building on your property. Generally, any structures larger than 100 sq. ft. require a permit in order to be built, but the rules differ street by street. While building permits are an easy thing to overlook, it is worth taking the time to find out the permit laws in your municipality are in order to avoid a much larger headache – or even a fine – in the future. Find out what you’re allowed to build and we’ll help you build exactly that! For a brief rundown, check out our blog post on the topic: “Building Permits: What You Need To Know”. Customizing your home office exterior can be the perfect way to integrate it into your backyard, creating a fluidity of style that suits your aesthetic tastes and perhaps even matches your home. Have fun with the exterior and customize to your heart’s content. We’ll help you adjust your roof pitch, add a dormer or a cupola, increase wall height, choose siding and pick the perfect windows and doors. We have over 50 to choose from! Our flat-roof styles are a great option for your modern backyard. See more interior shots of this beautiful space in: “The Modern Verana Pool House”.